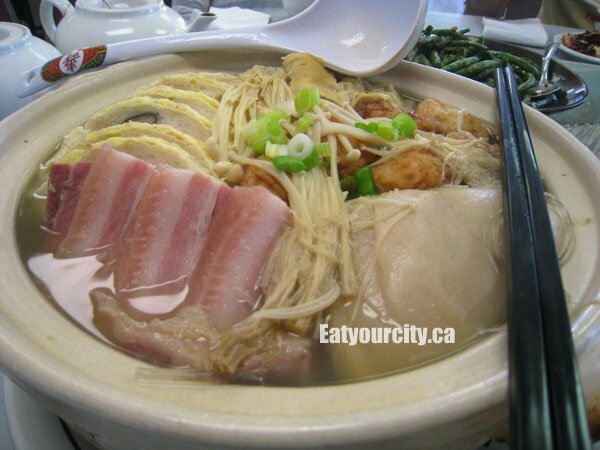 Eat Your City: Shanghai 456 - back again for yummy xiao long bao! Shanghai 456 - back again for yummy xiao long bao! Been craving ShangHai 456's tasty xiao long bao and potstickers, so we round up the crew (and my family) on a few separate occasions and brought along our appetites for almost dimsum style dishes alongside traditional Shanghainese cuisine. The unpretentious decor hasn't changed and neither has the badly translated menu, but we delve in, have a couple of our Chinese friends decipher and translate the menu, and ordered a few of our favs and a few new dishes as well. I've been lazy, so I've just combined the pics from a bunch of return visits. 1) The traditional "xiao long bao" or "tong bao" - literally translated as "soup dumplings" are addictively good as usual- gently wrestle the dumpling into your bowl without piercing the super thin dumpling wrapper that encases a rich burst of hot soup and a savory little nugget of meat. Eat them quick as they always disappear fast off of the table... had a fellow foodie claim that he can eat two orders just to himself! 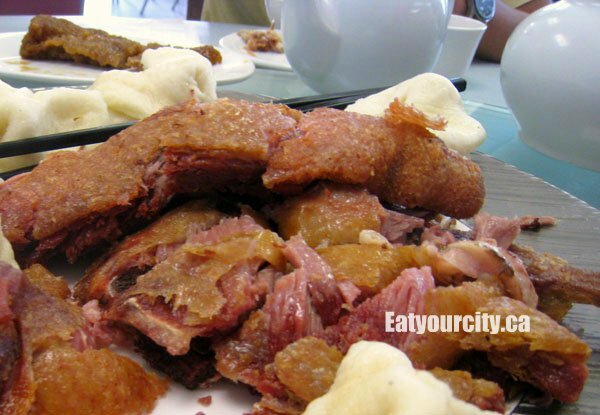 2) The double cooked duck - stewed and then deep deep fried to a flaky crisp is unique and tasty. Parts of the duck is so crispy, its like eating duck chips, and other parts tender and moist. As duck doesn't have much meat to it, if you are going in a larger group, get a full order rather than the half order. Its served with little plain white steamed buns in the shape of fortune cookies to balance out the richness of the duck. I think we ate most of the duck before we remembered to use them LOL! 3) The cold plate of drunken chicken is made and sitting in generous amounts of wine. The chicken is tender and moist with aromatic floral notes from the wine. You can get it as a half order (half a chicken) or a full order (entire chicken)... go with the entire chicken. The picture got eaten by the memory card monster... I'll post it when I find it. 4) The Buddha's feast or "yut bun wor" was a hot pot of goodness. Toppings vary depending on what the chef has on hand. On ours, we had slices of slightly smokey pork belly, an in house made vegetarian roll made of Chinese mushrooms, fish paste all rolled up in a thin scrambled egg roll, enoki mushrooms, chicken, in house made deep fried fish balls, tofu, scallop mushrooms, and green onions all nestled upon a bed of suey choy and rice vermicelli noodles. Everything was also swimming in a savory light broth. Simple, homey and super tasty! 5) The XO sauced green beans were a must with our group - crisp tender with oodles of garlic, heat and savoury flavor bits. Again, the memory card monster ate this pic, so I'll post it when I find it... I think this was our only vegetable dish tonight LOL! 6) Pan fried wor-teep (dumplings). Similar to the xiao long bao, these dumplings are filled with your choice of pork or beef and brimming with a rich savory broth - so don't pop them until they're in your bowl (or your mouth). Pan fried till they're lightly browned, we had lots of fun trying not to accidentally squirt anybody or anything as we bit into these dumplings. Mmmm. These disappeared fast too... into our collective tummies! 7) A fried steamed bun with condensed milk - An unassuming steamed white bun with its exterior fried to a crisp golden brown is full of bread "threads" that you dunk into a small bowl of sweetened condensed milk... so simple, but so yummy. The bread looks porous - but those are actually the individual threads that you can peel off from the interior like a cheese string. Heehee, we had a fun stealing and hogging the bowl of condensed milk (you can ask for extra but it was more fun this way). 7) Golden fried turnip cake - Two large deep fried incredibly flaky pastry orbs bursting with a moist mixture of diced meat (I think it was bacon), dried shrimp, green onions, peppery diakon and minced vegetables. Ask to get it cut up into smaller wedges as its surprisingly quite heavy, but oooh so savory good! Nom. 9) These beautifully crisp and multilayered puff pastries in the shape of flowers were filled with a lightly sweetened ground black sesame filling... almost too pretty to eat! 10) After sitting back to digest and chat, we nibbled on these sticky rice balls filled with a sweet ground black sesame filling. We struggled to finish these as we were soooooo full! But we had to make a good effort as the chef gave us these on the house. Nom! 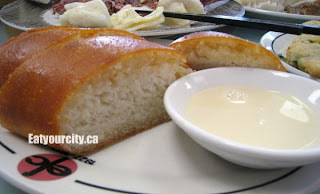 lol.. in my not so humble opinion.. this is probably the best place for xiao long bao in Edmonton. There's a few places that make it as well - but none that execute it with lots of flavorful broth, a savory chunk of meat inside or a super paper thin wrapper.. all with no preservatives... and made fresh daily - some places serve frozen ones.. bleeech! In comparison to Vancouver or Toronto - this would be middle of the pack, to middle top of the pack.